Our new and improved Saturn SUP (standup) boards have a black tracking pad and pointed front to a better cut through waves. Boards have also got a thicker 0.9mm PVC fabric on sides to prevent punctures, and extra strips of PVC fabric overlapping critical seams, to allow inflation for up to 15psi! The Saturn standup board is relatively easy to ride and allows paddlers of all skill levels, including beginners, to enjoy a stable, comfortable ride while getting a moderate workout. 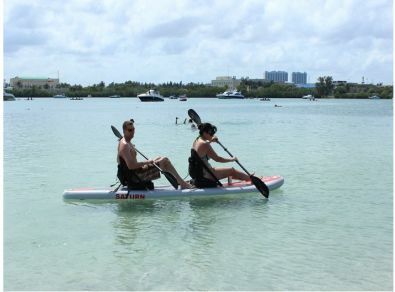 Stand-Up Paddle Boarding can be done in lakes, rivers or ocean. 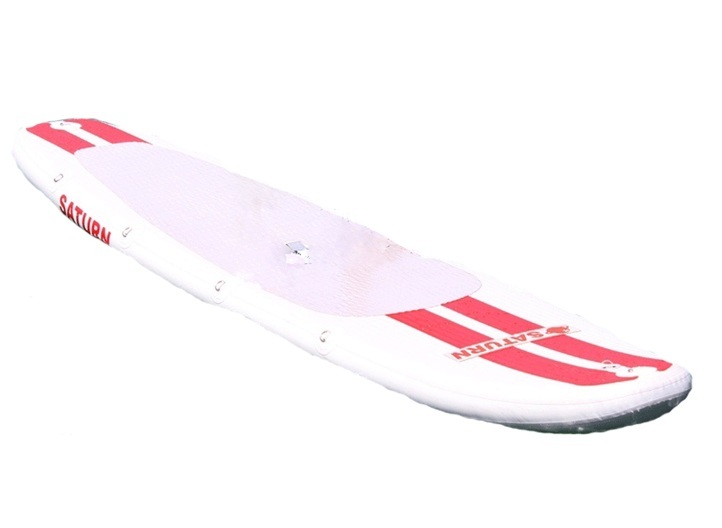 New, adjustable-length Transformer SUP Paddles are now available. 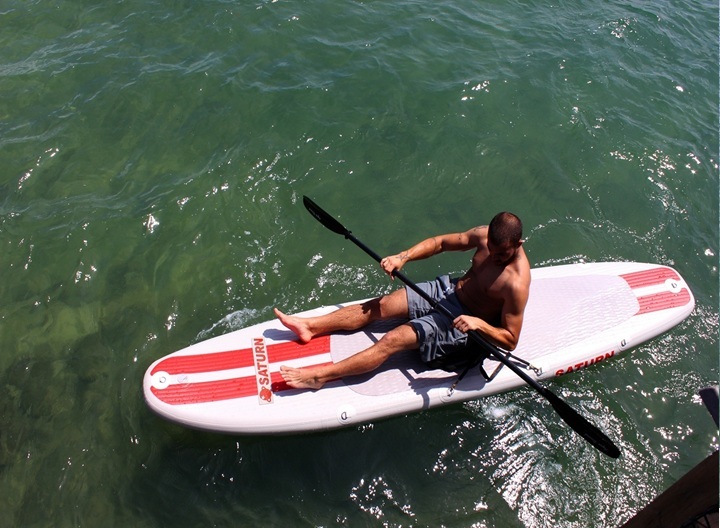 Our new exclusive SUP Paddles come with extra 2nd blade to transform it into a kayak paddle! 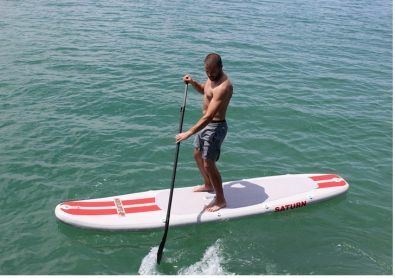 Transformer Stand Up Paddleboard Paddles are not only lightweight, but also brake up into 3 parts for portable storage and easy transportation. Get an inexpensive electric pump for mattress inflation sold in local retail stores. Use it to inflate paddle board to about 80% quickly, and then finish pumping to high pressure with provided hand pump. Open the valve cover, press slightly on the pushpin inside the valve with your finger tip to release some air pressure, then press completely and turn the pushpin in either direction, locking it in the open position. Turn the board fins up. Start rolling the board from the rear with the fins inside the roll. You can use a rubber bungee cord to wrap around the board to keep it from unrolling. 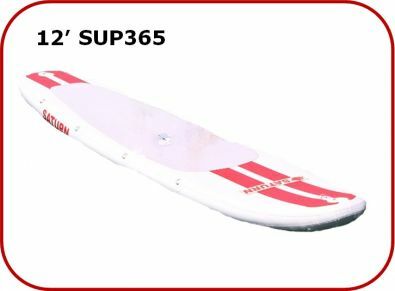 Saturn SUP330 can take up to 15psi. We suggest that you use our high-pressure electric pump that automatically shuts off once full pressure is achieved. If you use a hand pump and the air pressure gauge is not available, you'll need to pump until you feel the board surface become as hard as a rock. 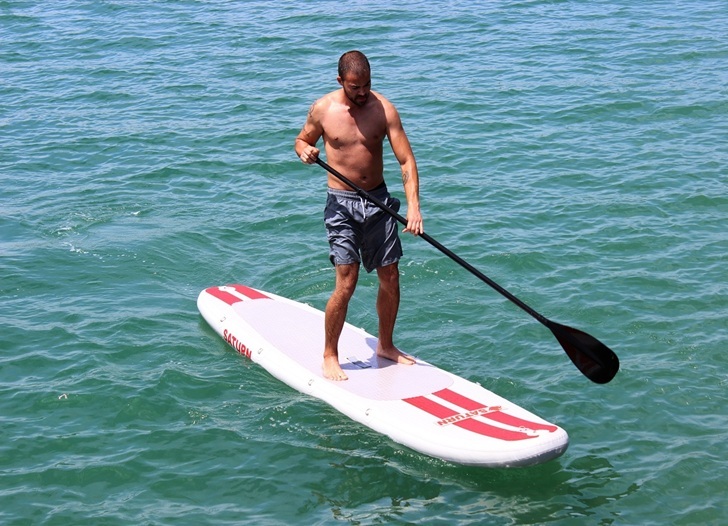 If the board is fully inflated, it will not bend under your weight when you are stand up paddling. If you are using the Saturn board as a sit-on-top kayak, high pressure is not as important as when standing on it. Just inflate the board until it is moderately hard and does not feel soft when you press it with your fingers. How to use the provided Bravo hand pump with gauge? Make sure you read instructions on the hand pump chamber. Apply oil to rubber seals inside pump and aluminum handle. Use double-action option to quickly fill up air chamber, then remove white plug and use single-action to finish inflation. Gauge will show air pressure on a down stroke only. If you want pressure gauge to show pressure readings continuously, then please remove rubber seal inside the valve adaptor. My paddleboard seems to be a little bit tipsy, why? "Hi, I bought a paddle board 12 ft from you guys and I use it in the french Mediterranean, and it's just amazing how stable the SUP is !!! Great SUP for great price!" "Stumbled across your blog. Looks like you have a great thing going here. Yoga and SUP is smnothieg I would have never conceived. Very cool!" "Just go out and try for yourself besuace I put my left foot out on surfboards, right on skateboards and right on snowboards. You never know until you try."